While Lucy was sleeping today, Norah and I went outside to clean out the car. Of course, Norah played on the front porch and in the garage while I cleaned. Seriously, I haven’t cleaned out my car in FOREVER! It was nasty! There were crumbs from a pumpkin muffin left from pumpkin festival which was over a month ago! It totally makes Kevin sick and he usually cleans out my car for me, but he has been so busy recently that he hasn’t had time. Sad really – that my 2 year old is so excited to have a clean car!! I took Lucy to the doctor today and she has an ear infection – which means the tubes are no longer in place. She seems to be over the tummy ache, but doesn’t have much of an apetite. She did wake up from her nap much happier than she has been all week. Hopefully, we are at the end of this bug. Norah seems fine – other than the fact that I made her get a flu shot today. She “couldn’t” move her arm all day today – you know, because of the flu shot. We had to cancel our plans to go to the pumpkin farm with the Diehl’s today. It was kind of a dreary morning anyway so we have rescheduled for a day next way. Lucy has a stomachache. I will spare you the yucky details, but she is pretty miserable. She didn’t sleep well last night so she was EXTRA grumpy. She took a 2 1/2 hour nap over lunch and woke up happier – but still not feeling well. She has just wanted to be held and snuggle with her blankie most of the day. Unfortunately, we will have to miss our Bible study tomorrow – which Norah and I really enjoy, so we are bummed to miss it. Hopefully, she gets over it soon and doesn’t pass it onto someone else. 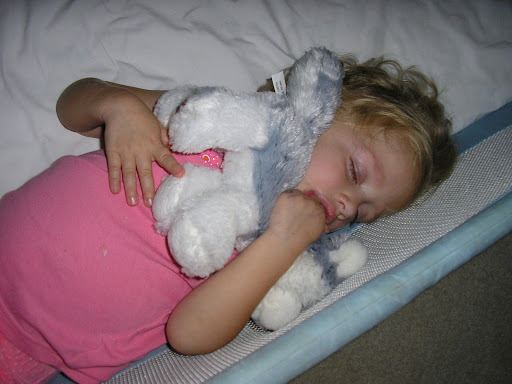 *Before bed Lucy was crying that her ear hurts – I guess we will be making a trip to the doctor tomorrow. Just after dinner Norah said her tummy hurts – great! Both girls were in bed and asleep by 7! They obviously don’t feel well. Just thought I would share a few funny Norah stories. First of all, she has decided she was her name to be spelled N-O-R-A. She leaves off the H all the time – on purpose! She got a little frog tatoo somewhere this week and wanted me to put it on her. She decided she wanted it on her left ankle because “that’s where Daddy’s is.” She also told me that she is going to take showers from now on because then it will stay on forever! She thinks Kevin doesn’t take baths because he doesn’t want his tatoo to come off. Ha! We had a hard time getting going this morning with all the excitement in our community. If you read Heather’s blog (I seem to always reference your blog, Heather – but you are better about posting current happenings than I am), than you already know what went on this morning. Kevin stuck around longer than normal this morning because traffic was back up all around our house for several hours due to police check points. Because the news kept encouraging residents to stay in our houses with our doors locked – our outside activities were not going to happen. By 10:30 the suspect was in custody and we were able to get on with our lives (I was glued to the TV all morning while the girls played/bickered downstairs. We read Here are My Hands, God Made You Nose to Toes, and From Head to Toe – 3 favorites of mine and the girls!! The weather is beautiful here so it was a perfect day for painting outside with feet. We are running low on our paints so the girls used pink, purple, green and yellow – which don’t look so great when smeared together. Norah tried hard not to mix the colors – Lucy, on the other hand, tried hard to mix them all over her paper! Inside the house we played a hand and foot twister – the girls giggled the entire time! I had cut out hands and feet the same colors that are on my color die. I rolled the die and the girls had to put a hand or foot on a cutout of the same color. Then I would roll the die again and the girls would put the opposite (hand or foot) on a cutout of that color. This game was a great way to assess Lucy’s knowledge of colors – she did great! We also practiced some of the gymnastics moves (the ones that involve using hands and feet to move) that Norah has learned over the past couple of years – crab walk, donkey kick, caterpillar walk, bear walk and monkey jumps. That about sums it up for us today. Check out Teaching Tinytots at Mommy School for other participants in this weeks toddler theme challenge. If you read Heather’s blog, then you know we went camping this weekend (okay, Kevin and Norah camped. Lucy and I joined in on the daytime fun). Those of you who know me well, know that I don’t love camping, but I will go ocassionally because Kevin loves it. We have probably camped 3 or 4 times in our 8 year marriage. I have actually thought that God gave me little girls so I wouldn’t have to camp very often – I know, dumb. Kevin has reminded me SEVERAL times that growing up they camped with families who had girls. I do love hiking, eating camping food, and roasting marshmallows – but I don’t really like sleeping in a tent. Anyway, Kevin and Norah had a great time!! As Heather said, the sun didn’t come up at 5 – so Norah slept until 7 or so both mornings. This is a way better time to camp than in the summer because the kids were able to get a normal night sleep and it wasn’t hot! I also think have Savannah there made a HUGE difference for Norah! They play so well together and let’s face it, there are just some things that are more fun with friends. Lucy had fun while we were there – she didn’t want to leave either night. First thing Saturday morning Lucy was begging to go camping again! She was concerned that the other kids might eat all the marshmallows. If you haven’t checked out Heather’s post – check it out. Her pics are way better than mine! Here are a few though. I am REALLY lacking motivation to do anything today!! The girls are at MDO and I have a million things I could be doing – but I’m watching Rachel Ray and blogging instead! We have our small group Bible study at our house tonight so I cleaned the kitchen well last night. I need to straighten up the living room and vacuum, but I also should organize the girls summer clothes that I have put away – they are just thrown in a big box. I also need to print off pictures from, oh – the last year or so to scrapbook! I would love to get caught up before the baby comes – is it possible? I am totally using the excuse that I’m pregnant – I need to take it easy, right?